Elouise Pepion Cobell (1945-2011), whose Indian name was Yellow Bird Woman, was a a member of the Blackfeet Indian Tribe of Montana and a great-granddaughter of Mountain Chief. Her parents were Polite and Catherine Pepion. Cobell was an Elder, Native American activist, banker, environmentalist, and rancher. Cobell graduated from Great Falls Business College and later attended Montana State University. Throughout her career, Cobell lead many companies and organizations, from banks to conservation nonprofits, and served on many Native and non-Native boards of directors. Cobell established the Blackfeet National Bank, the first national bank to be located on an Indian reservation and to be owned by a Tribe. After decades of seeking reform and an accounting of the trust funds belonging to individual Indians, she became the was plaintiff in the groundbreaking lawsuit, Cobell v. Salazar, which challenged the United States' mismanagement of trust funds belonging to more than 500,000 individual Native Americans. In 2010, the Obama administration offered a settlement of $3.4 billion to end the class-action suit. Cobell died of cancer at age 65 in Great Falls, Montana. Capriccioso, R. 10/17/11. Elouise Cobell, 65, Walks On. Indian Country Today. Cates, K. 10.17.11. Elouise Cobell, Blackfeet woman and pioneer of Indian trust lawsuit, dies. Great Falls Tribune. Indian Country Today Media Network Staff. 10.17.11. Elouise Cobell Remembered by Many. Indian Country Today. Klinkenborg, V. 10.17.11. Plaintiff for the Past. New York Times. McKie, S. B. P. 10.18.11. Indian Country mourns passing of Elouise Cobe. Cherokee One Feather. Nelson, V. J. 10/17/11. Elouise Cobell dies at 65; Native American activist. LA Times. Rave, J. 10.17.11. 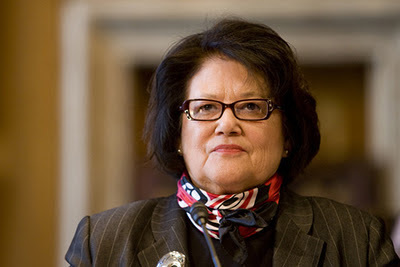 Elouise Cobell — Died Oct. 16, 2011: A warrior woman will be laid to rest. Buffalos's Fire. Shapiro, T. R. 10/17/11. Elouise Cobell, American Indian who championed class-action lawsuit against U.S. government, dies at 65. Washington Post. Volt, M. 10.17.11. Native American leader Elouise Cobell dies at 65. Boston Globe.